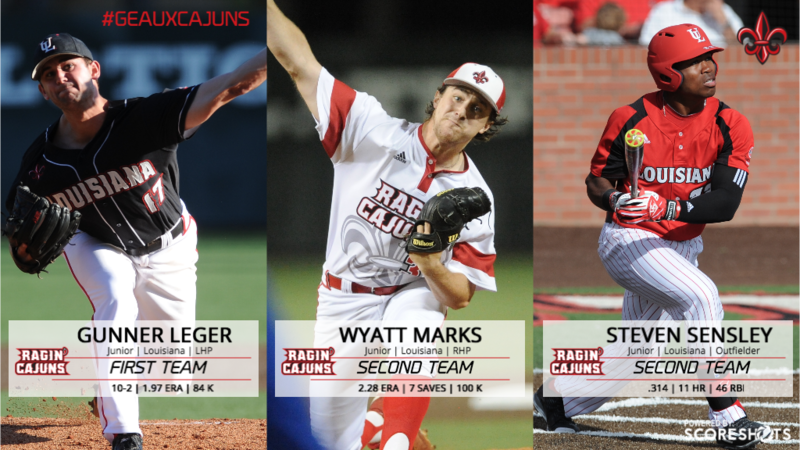 LAFAYETTE – Louisiana Ragin' Cajuns pitchers Gunner Leger and Wyatt Marks, along with outfielder Steven Sensley, earned more postseason honors as the trio was named to the 2017 All-Louisiana Baseball Team in a release by the Louisiana Sports Writers Association. The team was selected by a statewide panel of college baseball sports information directors and media members. Leger, named to the first team, posted a 10-2 record on the mound with was 22nd in the nation with a 1.97 earned run average. Leger became the first player in program history to be named a semifinalist for the USA Baseball Golden Spikes Award. The southpaw combined to post six shutouts on the season and limited opponents to two or fewer hits in five appearances. The Lake Charles native ranked in the top 50 nationally in hits allowed per nine inning and WHIP and came within an out of posting a no-hitter against Saint Peter's. Sensley, a second team selection, claimed the Triple Crown for Louisiana leading the team in average (.314), home runs (11) and RBI (46). He finished the season on a 26-game on base streak and ranked sixth in the Sun Belt in home runs and seventh in RBI. He posted 16 multi-hit games and a team-best 12 multi-RBI games. LSU's Greg Deichmann claimed Hitter of the Year honors with Alex Lange being tabbed as the state's Pitcher of the Year and Eric Walker earning Freshman of the Year honors. Head coach Paul Mainieri was named the LSWA Coach of the Year after leading LSU to the SEC regular-season and tournament title. McNeese State's Robbie Podorsky, named to the honorable mention team, was selected as Newcomer of the Year. Pitchers - Nate Harris, Louisiana Tech; Alex Lange, LSU; Gunner Leger, Louisiana; Mac Sceroler, Southeastern Louisiana. C - John Cable, New Orleans; 2B - Jordan Washam, Louisiana Tech; OF - Robbie Podorsky, McNeese; Zach Watson, LSU; UTIL - Ricky Ramirez, Jr., McNeese; Seth Stevens, Louisiana College.